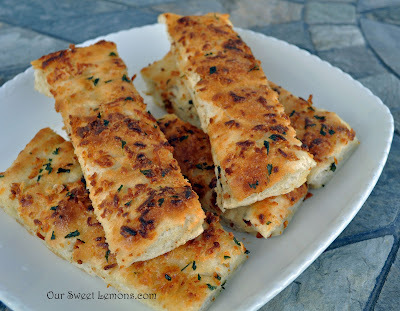 Our Sweet Lemons: Bread-sticks... Quick, Easy and Delicious! Bread-sticks... Quick, Easy and Delicious! Bread-sticks always seem to elevate a meal to YUMMY and these will do it quickly. Short on prep time and heaping with deliciousness, they are the perfect complement to any hurry up dinner. In our family we call these KellyAnne's Bread-sticks although I must admit, I've tweaked the recipe a bit from the original. Dissolve yeast in warm water. Add sugar and salt. Mix in flour with dough hooks and allow to beat for a couple of minutes. Press dough into a greased 10 x 15 inch pan. Mix butter and mayo, then add grated Parmesan cheese (or use powdered Parmesan). Spread over the dough. Sprinkle with garlic salt and dried parsley. So delicious served with Spaghetti or Soup or Salad... enjoy! 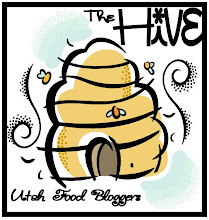 I actually prefer the Mayo... in fact, it's the secret ingredient for a moist texture as well as adding a bit of flavor. I forgot, Kelly, aren't you suppose to let the dough rise for like 10 minutes after mixing before you press it into the baking pan? I think that's what the original recipe said, although I can't say that I always do it and I don't know if there is a difference. I didn't let it rise.